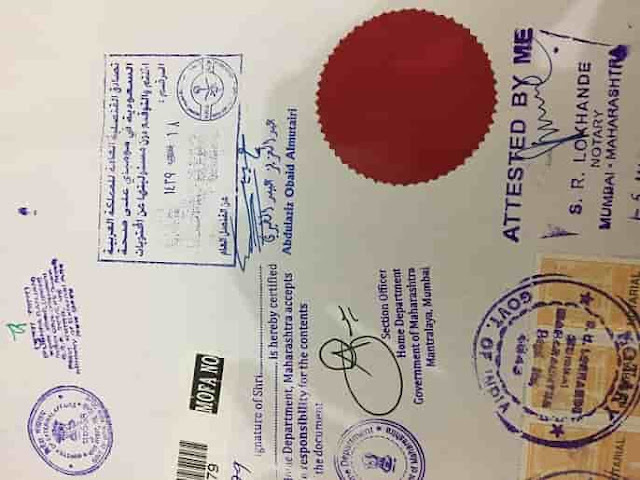 - The agent asked about 500 rupees to make Marriage certificate from Nikah nama, He sent request to WAKF BOARD OF THE STATE, where they collected my original Nikah nama or nikah certificate and issued Marriage certificate. You can also make marriage certificate through State Government in this case both bride and bridegroom should be present while issuing. - Once he received my marriage certificate, He sent it for attestation from HRD, Ministry of External Affairs (MEA) in Delhi and Saudi Embassy in Mumbai. He asked some documents for processing it. - Adhaar or Indian identity copies of both husband and wife. - Passport copies of both husband and wife. - I have waited for someone, who is coming from India to Saudi Arabia, Unfortunately i did not see anyone coming to Kingdom instead, I seen people going from Saudi Arabia due to the current situation.